Large-scale mining projects are strongly backed by the Colombian and Peruvian state as a source of revenue and jobs. However, they have a long record of damaging social and environmental impacts. They harm people’s health and disrupt food production. They contribute to biodiversity loss and pollute water sources. Local communities are frequently displaced, repressed and criminalised for protesting against these projects, triggered by the lack of effective channels of social participation into decisions affecting their livelihoods. 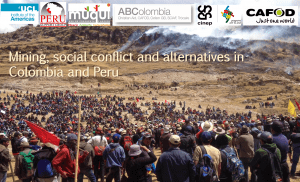 This event provided expert analysis on the situation of human rights defenders in Colombia and Peru in relation to mining operations, and alternatives to large-scale mining projects were presented. Listen to the podcast of the event. The panel discussion was chaired by Dr Graham Woodgate, Principal Teaching Fellow Environmental Sociology of the Americas, UCL Institute of the Americas. Translation between English and Spanish will be provided.